For decades, ICL has applied algorithmic and technological innovations to the process of pioneering, implementing, and disseminating dense linear algebra software—including the Linear Algebra PACKage (LAPACK) and Scalable Linear Algebra PACKage (ScaLAPACK) libraries. 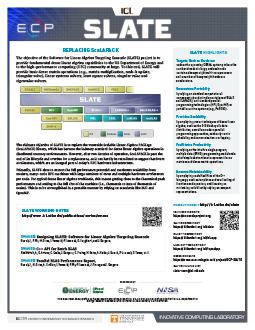 The Software for Linear Algebra Targeting Exascale (SLATE) project will converge and consolidate that software into a dense linear algebra library that will integrate seamlessly into the ECP ecosystem. For context, ScaLAPACK was first released in 1995, some 23 years ago. In the past two decades, HPC has witnessed tectonic shifts in the hardware technology, followed by paradigm shifts in the software technology, and a plethora of algorithmic innovation in scientific computing. At the same time, no viable replacement for ScaLAPACK emerged. 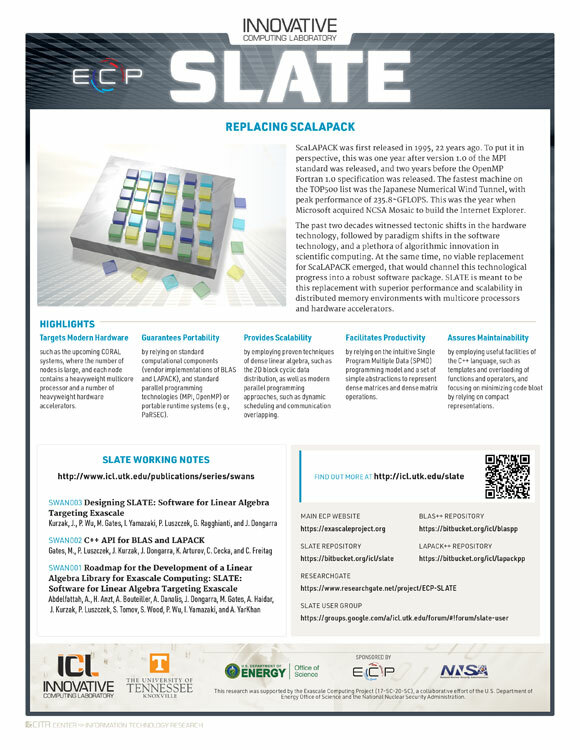 SLATE is meant to be this replacement, boasting superior performance and scalability in the modern, heterogeneous, distributed-memory environments of HPC.